Updates to Julie Ann's profile since your last visit are highlighted in yellow. Robert, born 1964; Kevin, born 1966 deceased 2008, Grandkids, Ryan, Ashton, Ajay, Elijah and Janna. More…Great Granddaughter, Peyton Nicole. Married in 1963. Moved to South Lake Tahoe in 1973, Divorced and remarried. Lived in Placerville, Ca.1976 to Aug. 2006. Retired from the Real Estate Business and bought a RV to travel until my son died in Dec. 2008. Husband divorced me after 33 yrs and I moved to Boerne Texas. Presently working in the Interior Design Business and have my own business doing Faux Painting. I am also a potter. I have 5 Grand children, age 27 to 16 yrs and 1 Great-Granddaughter, Born 9-2-17. all here in Boerne and San Antonio Texas. Life could not be better than it is today. I am Blessed. 50 year reunion.....FABULOUS. It was absolutely wonderful to see each of you. The party ended to soon. Julie Ann Melby McKnight has a birthday today. Julie Ann Melby McKnight updated profile. View. Julie Ann Melby McKnight added a photo to profile gallery. Julie Ann Melby McKnight changed profile picture. Julie Ann Melby McKnight posted a message. Thinking of the good old days and how blessed we all were to live in a time that was so simple. As teenagers, we did not think so but in comparison to the youth today...we were blessed. May your days be filled with joy and happiness. Julie Ann Melby McKnight posted a message. New comment added. 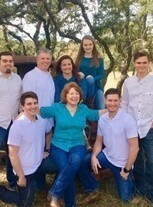 This was a great day with the family at the property in Comfort, Texas. The weather is wonderful today. Julie Ann Melby McKnight has a birthday today. New comment added. HAPPY BIRTHDAY TO YOU BRO. HAPPY BIRTHDAY TO YOU! HAPPY BIRTHDAY TO YOU, HAPPY BIRTHDAY TO MY VERY BEST AND WONDERFUL FRIEND, HAPPY BIRTHDAY TO YOU. I sure wish I was there to sing this to you and give you a big hug. God Bless you.